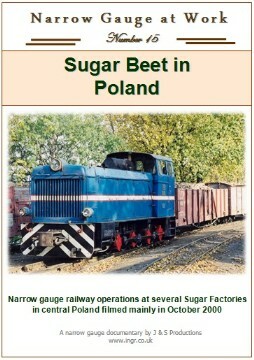 Even in 2003 the Polish sugar beet industry still used narrow gauge railways to transport beet, supplies for the sugar factories, and also the by-products of sugar beet processing. This DVD takes a close look at some of the railways associated with several of these sugar factories mostly of 750mm gauge. There is comprhensive footage of the factories and rail systems at Kruszwica, Dobre, and Brzesc, filmed in October 2000. From the mid 1990s, there is brief non-digital footage of Tuczno and Znin factories, plus other locations are seen in passing. All three main classes of industrial Polish diesels are seen in action, the Lxd2 (BoBo), LYd2 (0-6-0DH), and the WLS150(Lyd1) (0-4-0DM). A Wls150 loco shunting at Przybranowo, the terminus of the Tuczno system. Date: 1993. A Wls40 loco found by the loco sheds at the Dobre sugar factory. Date: 2000. A spread of 750mm gauge tracks inside the Kruszwica sugar factory. Date: 2000. One of the large Lyd2 locos arriving with a loaded train at Kruszwica Date: 2000. A Wls150 loco at the sheds in Kruszwica Date: 2000. Znin was the last 600mm system to transport sugar beet. A Lyd2 shunts more loaded wagons onto the train at Gasawa heading back to Znin. Date: 1994. At Znin the loaded trains passed over standard gauge tracks on the level to access the sugar factory. Date: 1994. At Brzesc sugar factory a Wls150 loco leaves to pick up more coal. Date: 2000. The Wls loco at Brzesc the Wls loco is seen behind the gates. Date: 2000. The Lyd2 loco waits to depart for Kruszwica at the Piotrkow loading point. Date: 2000. Much of the beet is loaded into the large bogie wagons by a dumper Date: 2000. At Dobre some of the beet was also delivered by the PKP, the state railways. Here a Lxd2 loco heads back to the Lowkowice loading point with a long train of empties. May 2000. A Lxd2 waits at Dobre station for permission to enter the reception sidings. Date: 2000. Heading back to Dobre along the southern branch belonging to the sugar factory. Date: 2000.